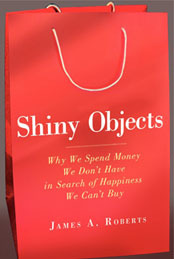 If you’ve read my book, Shiny Objects, you know I can’t resist a good story on how much Americans spend on their pets – talk about scary. Halloween is just around the corner and it looks like spending on All Hollows Eve is heading for another record. The National Retail Federation (NRF) predicts Americans will shell out $6.86 billion (one billion = 1,000 million) on Halloween in 2012. The average person will spend $79.82 on spooky decorations, frightening costumes, and candy. That’s an increase over the $72.31 we spent last year. 7. Bowties, fancy collars, etc. Although it didn’t make the top 10 list, and I hope you’re sitting down, 3.3% of those buying costumes for their pets will dress their dog up as a cat – will the fun never end? Laurie Taylor, A VP at Petsmart (which sells a lot of pet costumes) exclaimed, “Dogs like to wear them, dogs know when they look good” (WSJ, 10-24-12, D3). Halloween spending – truly a spooky tail (pun intended). This entry was posted in Uncategorized and tagged 2012, Halloween, pet costumes, Pets, pumpkin, Shiny Objects, spending, spooky, Top 10 pet costumes. Bookmark the permalink. 20 Responses to Halloween Spending 2012: Talk About Scary! Wow! I had no idea Americans spent that much on Halloween. Although looking back at my childhood, my parents would always buy me a new costume, decorate the house, and buy candy for trick-or-treaters. And we dressed our dog as a pumpkin one year! I guess I am no exception to the Halloween spending spree. The pumpkin is a perennial favorite 🙂 The Wall Street Journal says that it’s most popular in the South this year – so it all seems to make sense. Thanks for your post and please forward the blog on to others who might enjoy it. I have to agree and say I had no idea American’s spent that much money on Halloween and their pets! I love the idea of Halloween, but hate having to spend money on it. I get that from my mother because she thinks it is a waste of money to spend so much on a costume that will most likely only be worn once. And I feel the same way! It is so ridiculous that costumes costs around $50! I will usually try to make mine to save some money! That’s a little bit crazy to me that people dish out that much for Halloween. I’ve always been one to think that dressing dogs up is a tad silly. Although I will probably never do that, others find it as a way to bring out the holiday spirit. I think reading this blog or other articles that have statistics of how holiday money is spent, will allow the reader to take a step back to have a bird’s eye view of the situation. Maybe by seeing how much is actually spent on Halloween will cause some to cut back or some may not even give it two thoughts. Having matters laid out this way, for me, is beneficial. I knew Americans spent tons of money on Halloween, but I had no idea it was THAT MUCH! 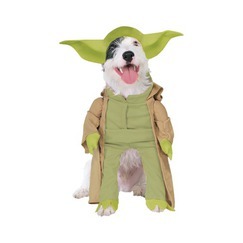 I also must admit I was slightly tempted to buy my dog a Halloween costume. 🙂 I decided against it when I saw how much they were. I do not think that people will cut back on their Halloween spending any time soon. Halloween spending is a real spike on the charts, not as much as Christmas spending but definitely an impact. On saturday I was in Austin and while walking across downtown, a couple passed by with their dog actually wearing a “Hot Dog costume”. It is really interesting to see how much money people spend not only themselves for certain occasions but also for their 4 legged companions. Then again thinking about it, I think it makes the people who buy their pets “clothing they don’t need” look good, its appealing, attractive, eye catching and “cute”. That’s eventually how marketers lure in potential customers. As trivial and comical as it is, it is very believable to me. I do not have a pet dog or cat, I personally have a pet Pig and now he is too large to dress up in an actual costume, but we do have “holiday” collars for him. This Halloween it is black and orange with bells. Well, I think not just Americans spent much money on Halloween day, so does some young Chinese. Many young Chinese people are very interested in western holidays. They feel cool to celebreate these holidays. They also spend many money to buy presents and colthes to have fun in the western holidays. I think it is a good thing to spend money on Halloween, because it can stimulate the economy and have fun together. I really like seeing the Halloween decoration. In Germany it is not so common to dress up for Halloween because we already have the ”Karneval” where all the people buy costumes every year and spend a lot of money on having the most crazy costume. I do not like it so spend to much money just for 1 to 3 days, but it is only once a year, so I can understand those who really love Halloween and maybe want to win a competition with their costume. We went to Wildwest last week and there were a lot of employees dressed up and I was so scared, it’s amazing. But I do not like when people exaggerate their spending on these things. That is a lot of money people are spending on costumes! I never spent too much money on pre made costumes but rather on materials to put together a costume which seemed to be a lot less than buying a full costume from a costume store. As for dressing up pets I am part of that 310 million dollars. I dress my dog up for pretty much every Halloween he has been around. It is just fun to dress up for any occasion. I actually just recently read an article about the biggest dog Halloween parade, which is in New York City. Hundreds of people dressed up their dogs, and took them to Tompkins Square Park in New York. They had random drawing where a dog could have a chance to win their owner am IPod, and the best dressed dog also had a chance to win thousands of dollars. It is crazy how much people really are willing to spend on their dogs, and how much the numbers at growing each year. I knew Americans spent a lot of money on Halloween, but like what some other people have said, I didn’t realize it was that much. Growing up my mom would put out a few halloween decorations around the house, but we never dressed up my dog for Halloween. When I was younger I would usually recycle my outfits, and even to this day I try to not buy a whole new outfit. This somewhat doesn’t surprise me. I myself don’t spend near that much on halloween, but when you take into account the fact that costumes can be $50 or more and a bag of candy can cost $10+, it’s not that hard to reach the $79.82 mark. And the last comment about the dogs ‘liking to wear the costumes’ definitely made me laugh a little. My roommate does in fact have a cow costume for her dog, and she absolutely HATES that thing. Wow!! Those are some pretty insane numbers!! I never actually thought about how much money people are willing to put forth on silly stuff for one scare. I can definitely see it now though. My family goes all out for Halloween every year! Homemade graveyard, skeleton pieces, floating creatures, and TONS of candy!! And with the pets, I think that’s funny that the Petsmart VP said how the pets enjoy the costumes. We dress our pup up every year and she won’t movea muscle with any sort of costume on. It’s more for us than it is the dog. This is very interesting and insightful of where all the money’s gone! Contrary to what Laurie Taylor said I tend to think that pets probably hate being dressed up, but I guess there’s no way to know. It’d be interesting to know how much, if any, pet costumes helped Petsmart’s business close to Halloween. Also, for the last few years I’ve kind of thought that Halloween hasn’t been as popular as it used to be. Maybe I’m wrong. But it would be interesting to know how much of the increase in spending was due to inflation. I always knew that Halloween was a big boost in revenue for candy manufactures, but I never thought about our pets bringing in revenue. I know that people will buy little costumes for their dogs, especially smaller ones but I never thought that they actually spent so much. If we wanted our family dog to look festive we would put a bandana around her neck! People really do see their animals as children and for Americans who do not have children this is their way of getting to spoil them. I think it can be cute to dress your animals up sometimes but I would never spend money on doing that. I have always known that spending on Halloween costumes was probably very over the top, because I am guilty of “accidentally” spending half my allowance on various costumes for the weekend activities. Over the past 3 years in college, I have found it to be more creative and cheaper when having 2 or 3 different halloween outfits! Me and my friends come up with something silly as a group usually and can find a lot out of our closets and buy the few extras from various stores. I think that if you take that into account the industry could be even larger. I find it very silly to dress up dogs because I am from the country and have mainly big outside dogs, but funny thing is that I say this and my parents dressed up the one little dog we have for the first time this year! She was so cute! This is incredible. Through these blog posts it has become very clear that the US spends money on some of the most undeserving items. This however, is just my opinion. I think the interesting thing about this post is that somehow these pet products were marketed in a way that provoked people to actually get their wallets out and spend the money. It is incredible to me how creative marketing can be. Creative designers and executive marketers get people to spend money on these “ridiculous” products. The cool thing is, they illustrate to people the importance of these products in a way that makes these products seem full of importance. We, as outsiders think these products are ridiculous. However, in reality these products are made important by the marketers that spend the time to design and portray there importance to every day consumers. What’s even crazier is that not only do we dress our pets and do more for our furry friends than we do our neighbors, but we also pamper them more than we do ourselves. There’s dog spas and pet massages that cost more than a spa treatment for a human. You can even take your dogs to get manicures and pedicures. Talk about splurging on your pet.